If you want to make the best connections, you must be visible. Visibility should be at the top of our “To Do List.” As lead learners, our lists are full of emails, phone calls, meetings, and paperwork, but we must have visibility (in permanent marker) at the top of the list. We should intentionally (put it on the calendar) be in classrooms, at recess, in the hallways, and out front during morning/afternoon dismissal to see first hand what is happening in our school. When you are visible to all, relationships begin to bloom because you learn to know the people with whom you work with…your Kids, your Teachers, your Staff, your Families, and your Community. What a positive feeling it is for parents to see you in the mornings greeting the kids with high fives and hugs. What a rewarding feeling to enter a classroom of fully engaged kids and leave a handwritten note in appreciation to the teacher. Through each of our actions as leaders, we begin to make connections through our interactions with kids, teachers, and families. Information coming soon on a set time for the #EduAr weekly Twitter chat! Look for slow chat questions or images with a post for the day. 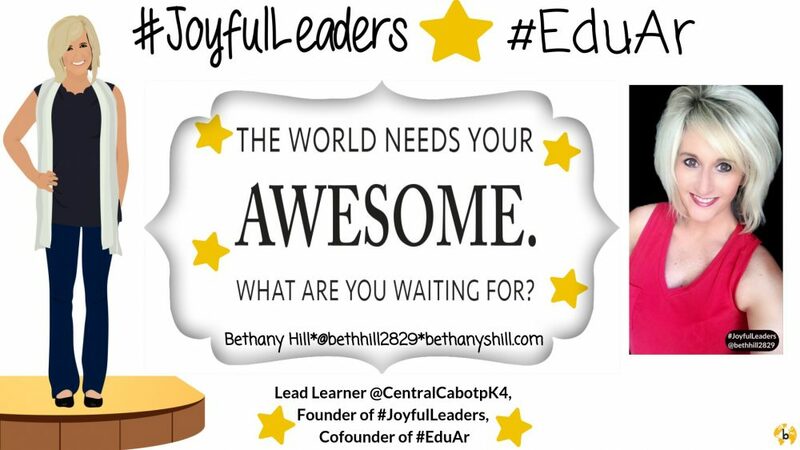 Please begin sharing by using #EduAr in your tweets. Let’s get connected within our state, and reach out to other states as a unified group of educators. Ready? This entry was posted in Edcucation, Innovation, Leadership, learning environment, professional learning, Relationships, School Administration, social media and tagged adult learning, Education, Leadership, Professional Learning, professional learning networks, Relationships. Bookmark the permalink. I appreciate your mission! It’s enlightening and empowering and has touched my heart to make conscientious choices to make connection happen, not just accept it randomly or by chance.